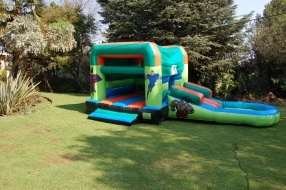 The Cartoon Super Hero II castle is a 3 in One castle: Jumping castle with roof, slide and ball pond. 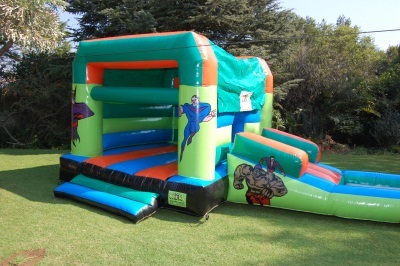 The castle has pictures of “Cartoon Super Heroes”, which makes this popular for boys. 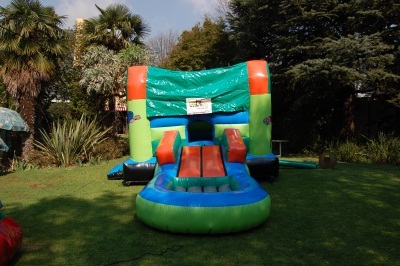 Slide extends from window on the bottom wall, which makes this very safe for smaller kids. Ball pond can be filled with “coloured fun balls”. Balls are rented separately and there is +-200 balls per bag. In bright colours: Orange, Spec Blue, Lime Green and Dark Green. 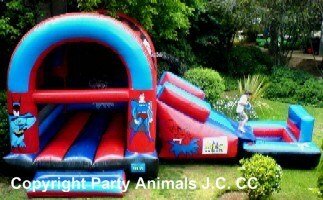 Dimensions: 7m in length and 3.75m in width. The motor is a 1.1kw motor with a 15m extension lead. If your power point is further than 15m from where the castle will be placed, you will need to provide an additional extension lead. These are not provided by Party Animals. All motors provided with a rain cover.